Hurricane Florence is plowing toward the U. S. East Coast as currently a Category 4 storm with a 500 mile wing span takes aim at the entire coastline from South Carolina up to northern parts of Virginia. South Carolina, North Carolina and Virginia have already issued Mandatory Evacuations. The National Hurricane Center said Florence was expected to slam into the coast around North and South Carolina as a Category 3 or 4hurricane on Thursday or Friday. The storm’s winds had increased to 140mph by Monday afternoon. 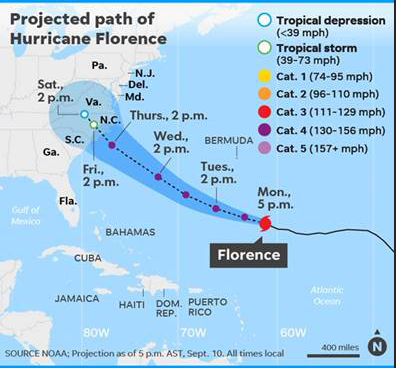 As hurricane Florence intensifies freight shipments will be delayed on the US east coast this week. Hurricane Florence is supposed to cause rough seas and strong rip currents, along with a potentially disastrous level of flooding. The navy said all ships in coastal Virginia were preparing to leave port for open seas. In addition, Hurricane Isaac is destined for the Caribbean later this week, while Hurricane Olivia is forecast to approach Hawaii as a tropical storm which will also slow down vessel movements to the east coast. If you have any questions or concerns about current shipments on the water or set to arrive via air into and around the area, please feel free to contact your local ECX office. We will continue to monitor the situation and updated.